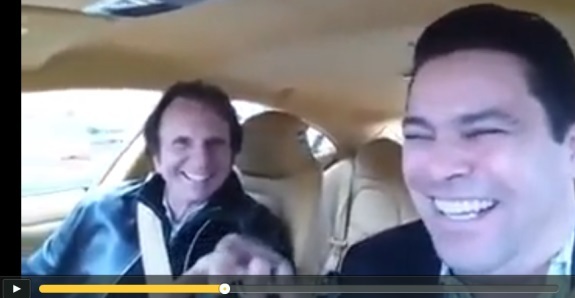 Racing legend Emerson Fittipaldi somehow ended up in a car with TelexFree figure Sann Rodrigues. Source: Video on DailyMotion. UPDATED 2:14 P.M. ET U.S.A. It is not unusual for financial fraudsters to seek to rub elbows with famous people or to imply ties to them as a means of sanitizing purported “opportunities” or accenting their own bona fides. Recent examples of this include Florida-based Ponzi-schemer/racketeer Scott Rothstein, who mixed with the elite as his epic fraud scheme spiraled out of control. Florida-based AdSurfDaily Ponzi schemer Andy Bowdoin (and any number of his promoters) falsely implied that then-President George W. Bush was on ASD’s train. The Mantria Corp. Ponzi scheme in Colorado traded on images of former President Bill Clinton and famous politicians or business executives. The WCM777 scam traded on purported ties to Siemens and scores of famous companies. Siemens publicy refuted the WCM777 claims. TelexFree, alleged to have gathered hundreds of millions of dollars in a combined Ponzi- and pyramid scheme targeted in no small measure at Brazilians and people who speak Portuguese or Spanish, aligned itself with the Botafogo soccer club in Brazil. The PR results were disastrous. Now comes word that Sann Rodrigues, a figure in both the TelexFree and iFreeX schemes, is seen in a video in which he is driving a car. That in itself wouldn’t be unusual, in that Rodrigues previously has recorded one or more videos that put him behind the wheel of a flashy ride. But in this case the passenger in the car is Emerson Fittipaldi, the Brazilian racing legend who won the Formula One World Championship twice and also is a two-time winner of the Indianapolis 500. The PP Blog has sought comment from Fittipaldi through multiple channels and hopes to hear back from the legend. If Fittipaldi or his organization responds, we’ll make sure you see that response. Rodrigues was charged by the SEC in April 2014 with securities fraud for his alleged role in the massive TelexFree swindle. This marked the second time the SEC had implicated him in a fraud scheme. The first was a 2006 scam known as Universo Foneclub Corporation. Like TelexFree, Universo Foneclub allegedly was targeted at the Brazilian community. TelexFree also is under investigation by the U.S. Department of Homeland Security and Federal Police in Brazil. At the same time, the Securities Division of Massachusetts Commonwealth Secretary William Galvin also is investigating TelexFree. In September 2014, Galvin issued a warning about iFreeX, another “program” associated with Rodrigues. T-Mobile, the famous phone company, later said it was checking to see if its branding material was being misused by iFreeX. Precisely how Fittipaldi ended up in a car with Rodrigues is unclear. Early research suggests Fittipaldi made an appearance at a hotel in the area of Orlando, Fla., on or around Jan. 6 of this year. Rodrigues may reside in the Orlando area. The Orlando event appears to have been arranged by a venture known as DFRF. The asserted operator of that venture is Daniel Fernandez Rojo Filho. (The Ferdandez name also has been spelled with a trailing “s,” as opposed to a “z.”) His name surfaced as part of the Evolution Market Group/Finanzas Forex case in 2010. It is clear that some Brazilians interested in the TelexFree case are closely following the appearance of Fittipaldi alongside Rodrigues, wondering if the racing legend is being duped by an alleged recidivist swindler. No big deal, Phil Ming Xu got pictures with the Woz, and some other scammers got pictures with Will Smith. Mr. Daniel Fernandes Rojo Filho, who has recently been arrested in the US and charged for operating a Ponzi Scheme, has been using images with Mr. Emerson Fittipaldi promoting his products and his company DFRF Enterprises LLC. We would like to infom that Mr. Emerson Fittipaldi has attended some events in Orlando, which Mr. Daniel Rojo was also present at. However, Mr, Fittipaldi, never had any business relationship with Mr. Daniel Rojo or with one of Mr. Rojo´s companies. The use of pictures taken occasionally for promotional purposes has never been authorized. Several times we have requested to have these pictures taken off, which never happened.